Many engineers coming into the profession of welding engineering lack a background in design and construction of welded structures and plant. This book has been written with such engineers very much in mind. The safe performance of a structure relies on materials and methods of fabrication which can respond to the explicit or implicit design requirements. It is essential that the welding engineer has the opportunity of making his specialist input to the design process, and an understanding of the basis of the design will help that contribution to be most effective. It is also important that the practising design engineer acquires a basic knowledge of the relevant aspects of welding to be able to execute satisfactory designs and, equally important, to know when to seek the input of a qualified welding engineer. 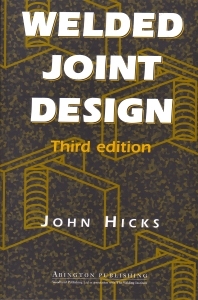 Designed for both students and practising engineers in welding and design, the book will also be of great value to civil, structural, mechanical and plant engineers. There is also much that will interest test houses, welding equipment and consumable manufacturers, classification societies and steel companies. Fundamentals of the strength of materials; Stresses in some common types of structures; Elementary theories of bending and torsion; Basis of design of welded structures; Weld design; Calculating weld size; Fatigue cracking; Brittle fracture; Assessment of structural integrity.